Thank you to all of the great organizations who are supporting Let’s Read and helping us spread the word about our volunteer opportunities! L.A. Works, of course, sponsors this program. They do a great job reaching out to volunteers all across Los Angeles. Please be sure to check out their Opportunity Calendar for other excellent community service projects. 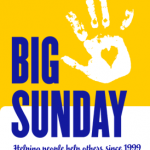 We would also like to thank Big Sunday, which is committed to building community through community service. They have been kind enough to feature Let’s Read on their Community Calendar page. Thanks! And we’d also like to thank the UCLA Volunteer Center for posting Let’s Read opportunities on their website and Facebook page. If you know of any other websites or forums that can help spread the word about Let’s Read, please let us know!